We love it SOOOO much, a million thank yous. She's been out there mornings and afternoons, dragged in when it gets too dark... it's amazing! How sweet and cute. My garden fairies are quite envious of it, as am I! Leslie, this turned out so sweet. I love the look on Sweet G's face, she obviously loves it a lot....and talk about creating a bonding moment and creating a love for gardening! Wow - that is so impressive. Carol is right - it's off the charts o the cute factor. I loved that little garden in Buffalo, too. You're so creative! Leslie, it's wonderful~I know several little girls who would love this wonderful box and probable several 'older girls'! gail I wish more children were given time for imaginative play instead of scheduled into activities. what a wonderful idea. Those are great links. Of course, I'll have to do this with GREAT-granddaughters. Not that I'm bragging. This is the most darling thing! I need to track down a box so I can make one for the girl. You are the best grandma. When my granddaughter is just a bit older....I will make her one. This is so adorable! I came here by way of Mr. McGregor's Daughter, Leslie, and I'm so glad I did. This is the perfect gift for a sweet granddaughter. 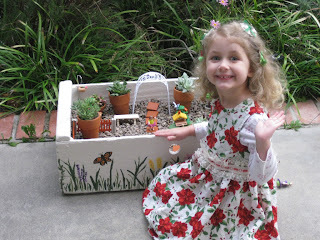 Not only will she enjoy playing with it now, but you're fostering an interest in gardening in the future as well. 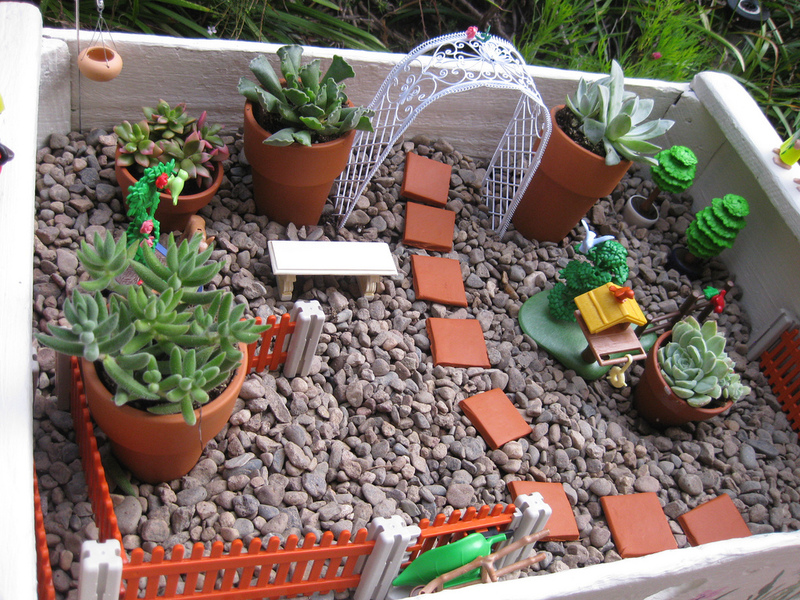 Leslie, that fairy garden is just adorable and clearly the Sweet G is delighted by it. What a wonderful way to keep her linked to you even though you're apart. You did a fabulous job! Your charming creation can only be outdone by your granddaughter's cuteness! This is a very nice idea for people who want to have a garden but have no space at home. It really is beautiful. We just loved it, you have given such a beautiful idea for making fairy garden the steps are so cute. I will make one for my daughter. Thanks a lot! !